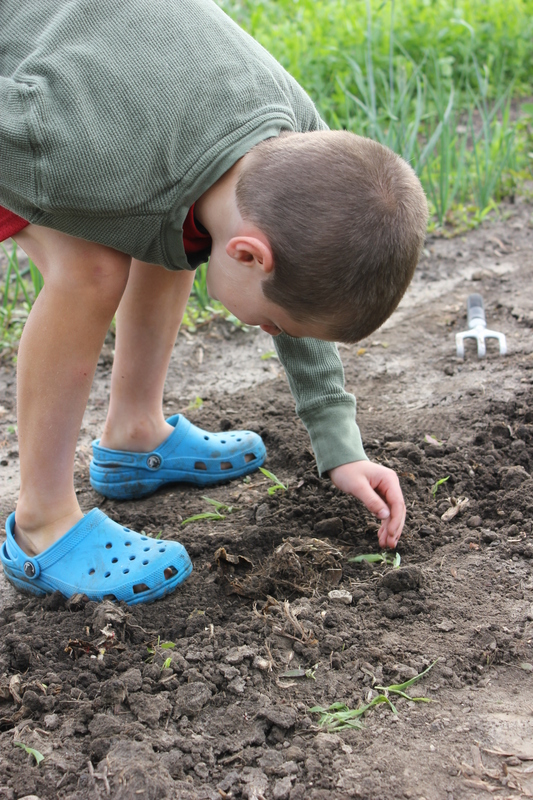 Weeding and worms – that is what is growing on in the garden. Lots and lots of weeding occurred this weekend. The weeds are then fed to the chickens. We weed so that our crops receive the nutrients and water from the soil instead of the weeds. The weeds can choke the plant out of its space and cause our crop to die or not be productive. While we are weeding, the boys also have a jar near by to put worms in. Not only do they like to use the worms as bait when we go fishing, but they simply think worms are cool. 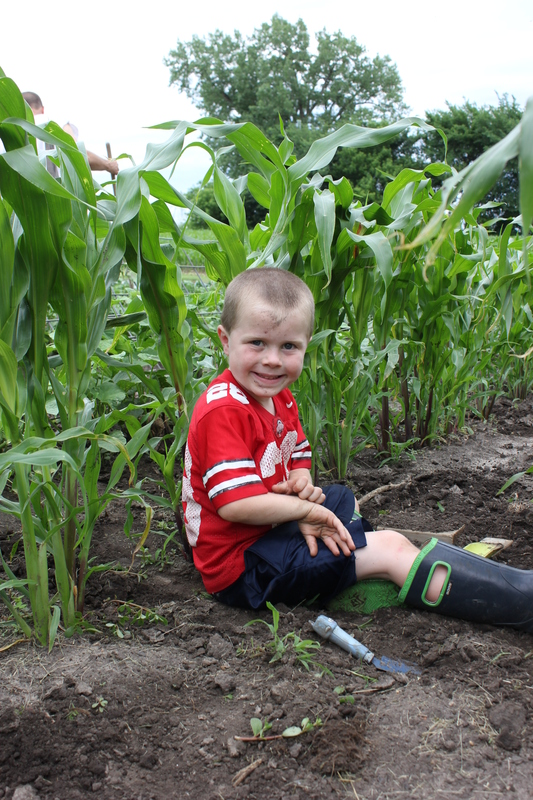 In addition, the ornamental corn is growing like crazy and a great place for Sam to sit to be shaded from the sun. As we were working in the garden, the kids asked me some good questions that I thought some of you may like to know as well. So below are a few clarifying terms that I hope are helpful. Annual – A plant that grows for one growing season. Most of our crops our annuals and are replanted every spring. Perennials – Plants that grow back on their own for more than two years. A perennial crop produces year after year. Crops that are examples of perennials would be rhubarb, asparagus, strawberries and blueberries. Germinate – When a seed that you have planted begins to grow. Replant – When a seed does not sprout. We had to replant some seeds because they rotted in the soil. The soil was to wet over an extended period of time because of all the rain we received. Once the soil dried enough, we replanted it in the soil. Now we are hoping that it will germinate or begin to grow. Pests – We deal with a variety of pests in our garden. A pest is a destructive insect or other animal that attacks crops, food or livestock. Pests we deal with our weeds, insects (ex. potato bugs, squash bugs) and wildlife (rabbits and deer). We also were replanting different crops. The constant wet weather caused some of our seeds to rot and not grow in the garden. So we replanted some of these crops this past week. Not only do the insects like to eat our crops. So do the rabbits, see what they did to the cabbage. This is the way the cabbage looked before the rabbit enjoyed a meal. Potato bugs can lay up to 800 eggs at one time. While everyone has been diligent in searching for the adult potato bugs and the eggs, we weren’t fortunate enough to find all of them. Sam is holding four stages of potato bugs. On the leaf are the eggs, the largest bug is the adult and on either side of the adult are red dots which are different stages of baby potato bugs. We have been researching our options and recognize that constant monitoring is necessary so that an infestation does not occur. An infestation will cause them to not only eat the potato plants but other crops as well. This list is prepared before we harvest your share. Some guesswork is involved! We do our best to predict which crops will be ready to harvest, but sometimes crops are on the list that are not in the share, and sometimes crops will be in the share even though they’re not on the list. Rhubarb – one pound equals about 3 cups. Wash, cut the ends off, cut off any bad parts. No need to peel. You can freeze it in a Ziploc bag (no blanching) and use for months to come. Our family loves it in muffins, breads, jam, pie, crisp, sauce and torte. Check out our recipe ideas below. Asparagus – Fresh cut asparagus from the Chute’s Farm Fresh Gardens in Aitkin, Minnesota. These farmers are friends of ours who we know from Farm Bureau and also the Minnesota Agriculture and Rural Leadership Program. They had some extra they wanted to share with us, and the delivery time worked out well. Enjoy! See how asparagus is harvested in California. Black Seeded Simpson Lettuce – One of my favorite garden crops. Remember to wash your vegetables before eating. See how lettuce is grown throughout the year so it is available in our grocery stores even on our cold Minnesota days. Prizeleaf Lettuce – what a beautiful colored lettuce to add to the salads. Add some fresh strawberries or dried fruit to your salads and Enjoy! Red Oak Leaf Lettuce – I love this beautiful red lettuce leaf. It adds such a wonderful color to your salads. Spinach – Remember to wash before eating. A combination of these vegetables will make such a wonderful meal! Some spinach salad ideas from P. Allen Smith. Beet Leaves – Many times I have seen in high-end restaurants beet leaves in my salads. Well here is your opportunity. These are young plants that we are thinning out of th rows – eat the whole plant. It will add color and nutrition to your salads. Learn more here. The boys gather, clean and pack the eggs. They hope you enjoy them! Eggs – Enjoy some fresh eggs from our chickens. The varied sizes and colors come from a variety of breeds of chickens as well as different ages of chickens. Please feel free to ask the boys about the different sizes. They will be happy to identify the hen that laid it. Fresh cut arrangement – Hosta leaves…these last forever in a vase of water. After a week, give them a fresh-cut, and they will last longer. The greenery in the house is a day brightener. This is Keith’s favorite – Rhubarb Torte. It is one of my favorites as well! We were so excited to have some tonight that we ate two pieces for “supper” before you all picked up your boxes tonight! Pat it into a 9×13 pan. Bake for 25 minutes at 325 degrees. •1/3 cup cream; •3 egg yolks beaten; •3-4 cups rhubarb; Cook until thickened. Pour over crust after it has baked. Bake at 325 degrees for 15 minutes. 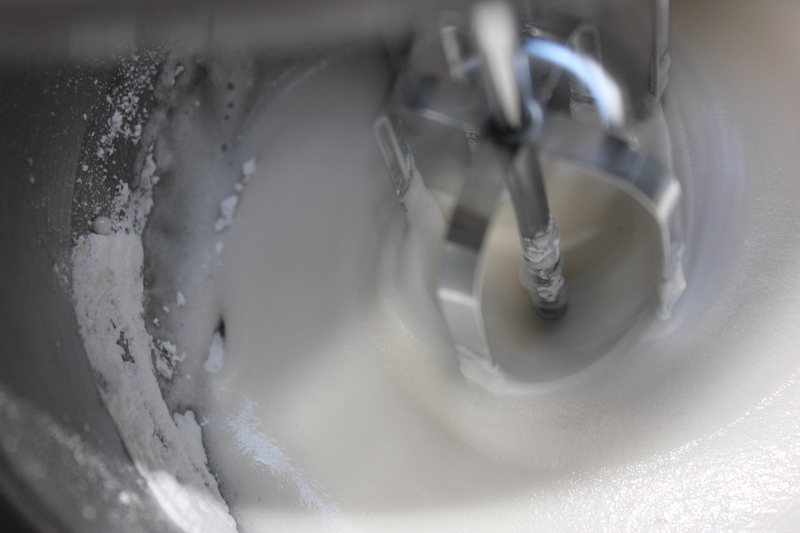 Mix on high until stiff – 3 egg whites. •1/4 teaspoon cream of tartar; •Dash of vanilla; •Dash of salt; •1/3 cup powdered sugar. Spread over middle rhubarb section. 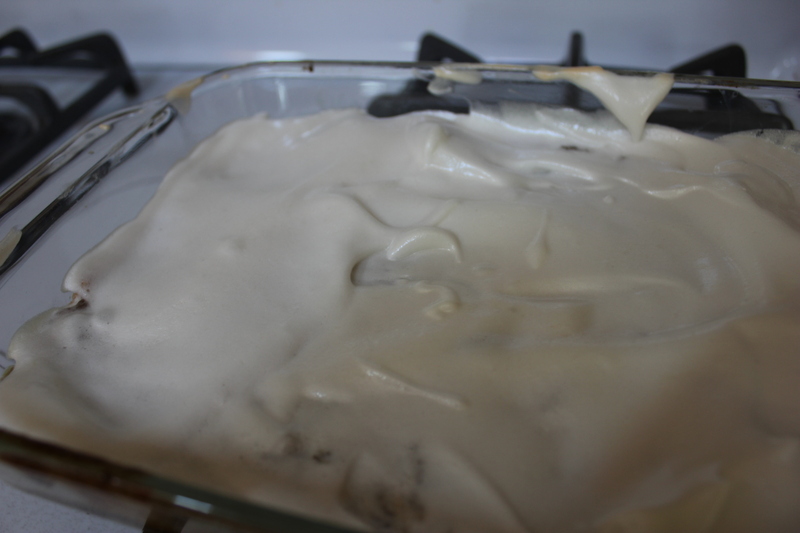 Bake at 325 degrees for 5 minutes to brown slightly the meringue. Bake for 25 minutes at 325 degrees. Cook until thickened. Pour over crust after it has baked. Bake at 325 degrees for 15 minutes. 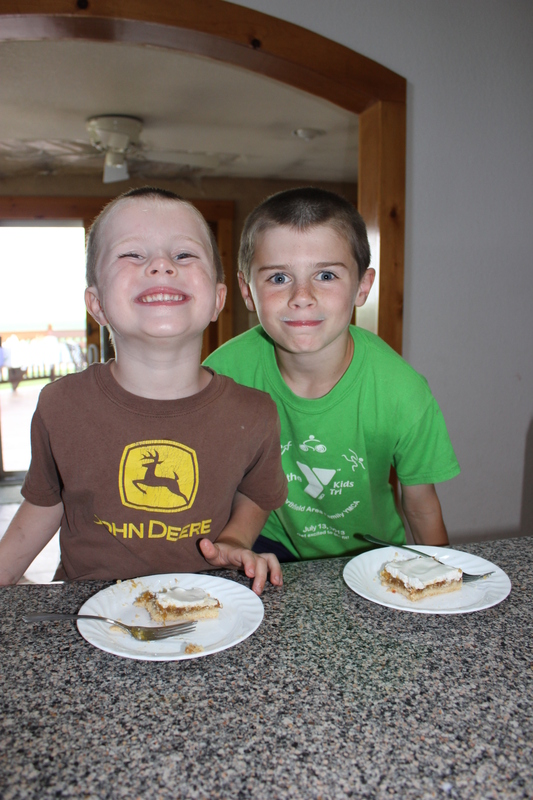 In the end, I have happy boys eating rhubarb! Thank you to one of our shareholders Tracy Modory for sharing this easy jam recipe that was a success in her house. Looks delicious! 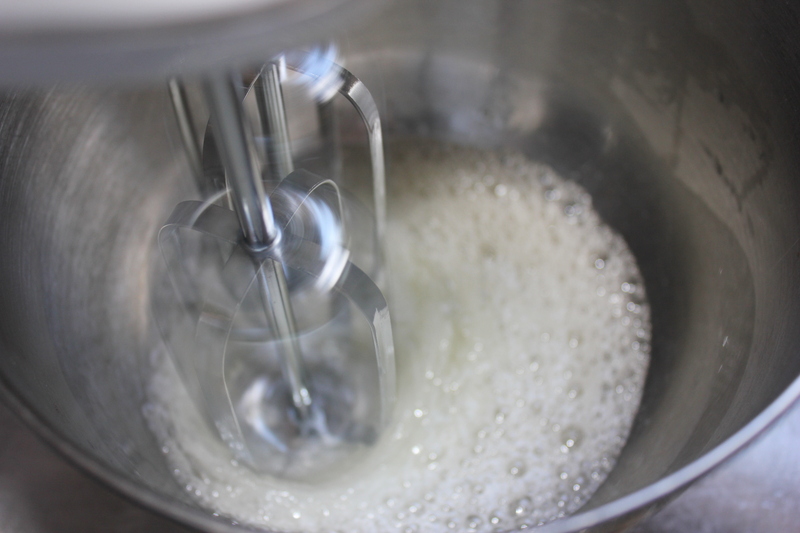 Process all ingredients in a blender, transfer to jars and refrigerate overnight. The chia seeds will gel, thickening the fruit puree. No need to cook the fruit. This can also be frozen after refrigerated overnight and thawed when ready to use. The weather the last few days has been tumultuous. During these types of moments, I find myself frequently checking weather, checking social media and watching the clouds. You might find this odd. I find it normal. Because it is what I grew up with – checking and watching weather. I remember many moments where we would watch the clouds roll over with varying results. The ones I remember the most are the clouds that were green and eerie which would burst open to the ground full of rain, wind and hail. After the storm, we would go to the fields to check the crops. More often than not, we would find the crops shredded by the hail and laying flat because of the rain, wind and hail. To say this was disheartening is an understatement – money and time gone. All of that hard work was gone: dad planting, mom doing field work, my brothers and I picking rock (walking back and forth in the fields to throw rocks larger than a baseball into a loader bucket or hay rack – this is done so the rocks will not break a very expensive part of the equipment) and walking beans (hoeing and/or spraying weeds that would choke out the plants resulting in a poor yield – the sole purpose was to kill the weeds). Most years my parents had crop insurance on the crops, and we replanted the crops. This post by a friend of mine may help explain. But what people don’t understand about farming is a farmer is at the mercy of the weather, and Mother Nature never takes a day off. What does all of this weather mean for our CSA? Well if we were to get damaging wind, rain and hail – there would be no crop to harvest. We would have to replant and wait for it to regrow. We have no crop insurance for our crops. That is why we were out during “breaks” in last night’s storm – harvesting. I was watching the weather and fearing wind and hail were going to damage the crop last night. We were fortunate that this time we did not receive the damaging storms. We instead received about 2 inches of rain this weekend and a 1/2 inch of rain yesterday. 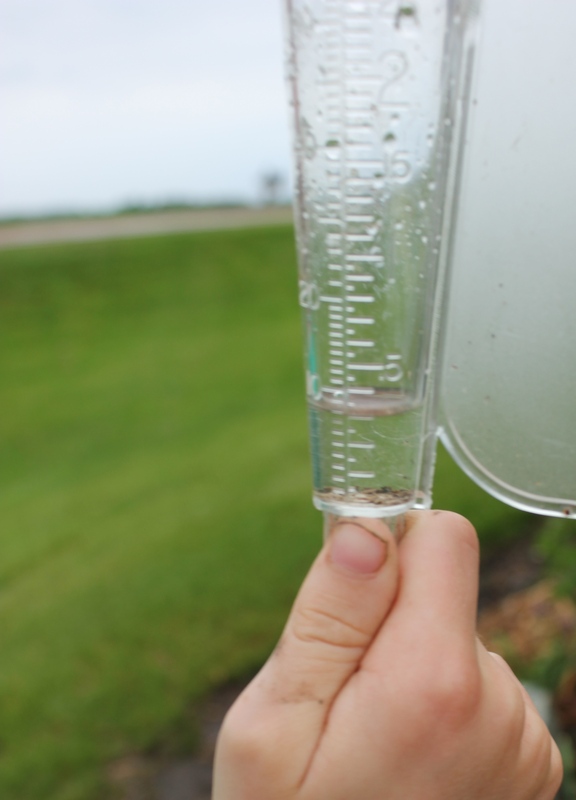 A far cry from the 8 inches – 12 inches of rain some received in southwestern Minnesota. So how do farmers handle not being able to control Mother Nature. Well, most of the farmers I know have a very strong faith in God because they understand that God will provide in his own way. With that said, many of the farmers I know are also avid weather watchers. While it may be out of our control, Mother Nature is still simply amazing to watch. 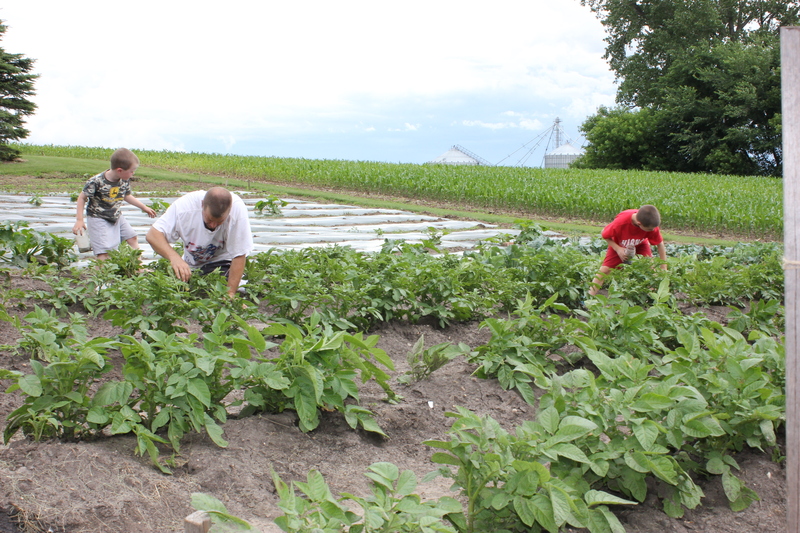 At 6 a.m. before the rainstorms this weekend, Steve was out hilling the potatoes and tilling some weeds. We hill the potatoes plants to provide a better growing medium and area for the plant to grow potatoes. Potatoes grow under the soil. This blade is attached to the back of the tiller and pushes the soil to the sides thus “hilling” the soil around the potato plants in their rows and providing more area for the potatoes to grow. Steve and the boys installed the cucumber trellis this weekend. This will allow the cucumber plants to grow on the fence. The cucumbers will grow and drop between the slats in this old fence. Thus keeping the cucumber cleaner since they are off of the ground. The fences are upcycled from my mom and dad’s farm. Sam was busy inspecting the crops this weekend. We had a lot of questions regarding the mulch and why we have mulch on some of the crops. We mulch the vines and tomatoes to help with weed and plant disease control as well as regulate moisture to the plants so that they grow more consistently. 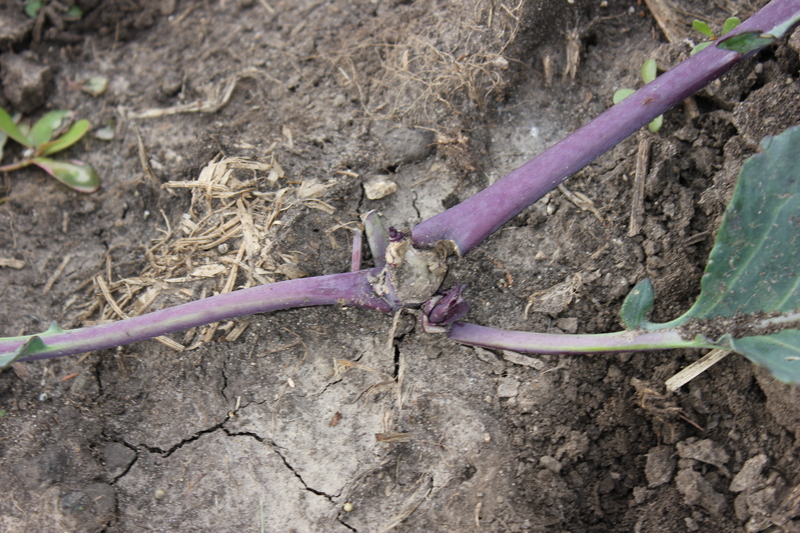 For example, inconsistent moisture can cause splitting and blossom end rot issues with potatoes. In addition, especially with the tomatoes, the mulch helps to keep those vegetables from getting as much soil on them – thus keeping them cleaner. An interesting comparison, Sam’s hand compared to the cotyledons of a pumpkin plant. Cotyledons are the first leaves of the plant to emerge from the ground. Keith and Sam burying egg shells buy some of the Big Moon pumpkins. They have decided to bury eggs shells by these two pumpkins all summer and see if this will make a difference in the size of the pumpkins at harvest time. Rhubarb – one pound equals about 3 cups. Wash, cut the ends off, cut off any bad parts damaged by wind or hail, chop into 1/4 – 1/2 inch pieces. No need to peel You can freeze it in a Ziploc bag (no blanching) and use for months to come. Our family loves it in muffins, breads, jam, pie, crisp, sauce and torte. Check out our recipe ideas at Taste of Home. Asparagus – Fresh cut asparagus from the Chute’s Farm Fresh Gardens in Aitkin, Minnesota. These farmers are friends of ours from northern Minnesota. They had some extra they wanted to share with us, and the delivery time worked out well. Enjoy! We love to eat it cooked and sprinkled with Parmesan cheese. Here is some fun information about asparagus. Radishes – wash, cut off the tops and also the bottoms, slice and enjoy in salads. Some enjoy dipping in salt. Thank you to one of our shareholders Amy Sillanpa for sharing one of her mom’s favorite rhubarb recipes! 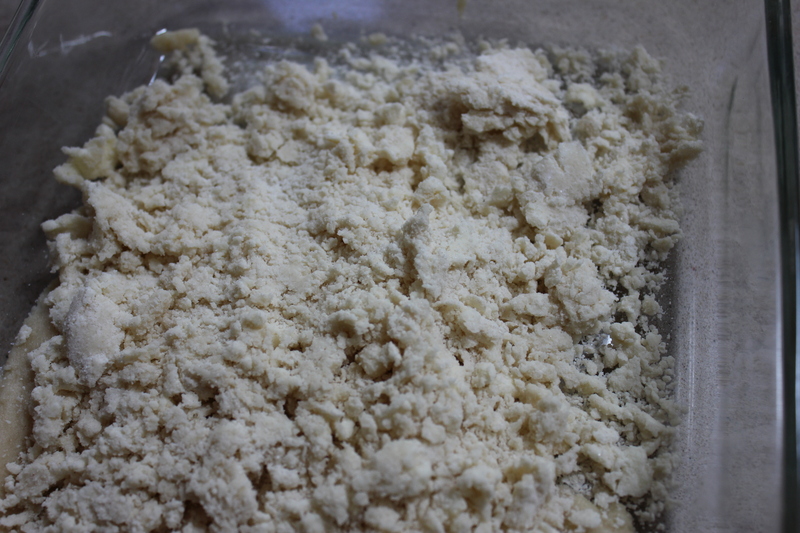 Mix first four ingredients until crumbly. Press half in 9 inch square greased pan. Cover with 4 cups rhubarb. Combine last four ingredients and cook until thick and clear. Add 1/2 teaspoon red food coloring. Pour over rhubarb. Top with the rest of crumbs. Bake at 350 degrees for one hour. Serve war or cool with whipped topping. Welcome to our CSA! Yes, the boys do help in fact they were out before 7 a.m. picking your rhubarb. The leaves are so big on these plants. I remember as a child using the leaves to make “clothes.” They definitely would not work as a prom dress! Welcome to all of our shareholders. We appreciate the opportunity to work with you and for you through out the growing season. 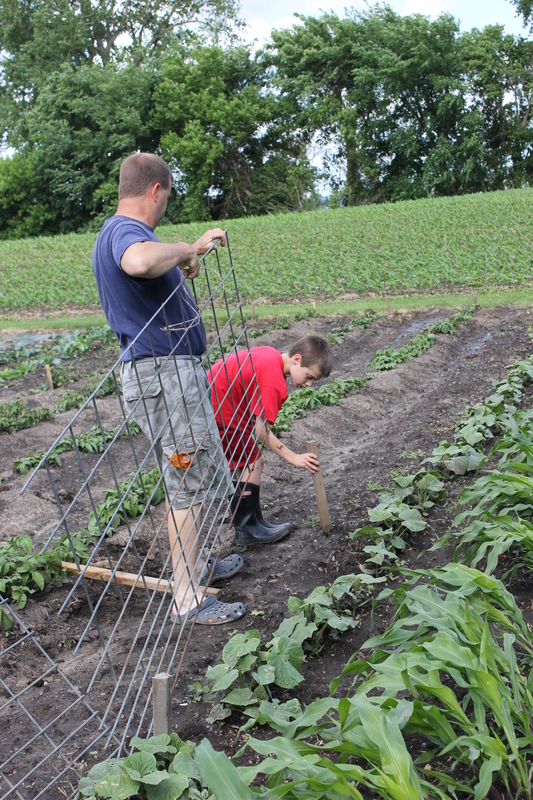 We work hard to earn your trust and respect in the food that we grow for your families and ours! All of you should have received an email with more details of dates and specifics with the CSA. We are excited to see the daily changes and growth in the garden. Look for weekly blog posts for guidance throughout the season which will provide you with updates, ideas for your box of produce and recipes. 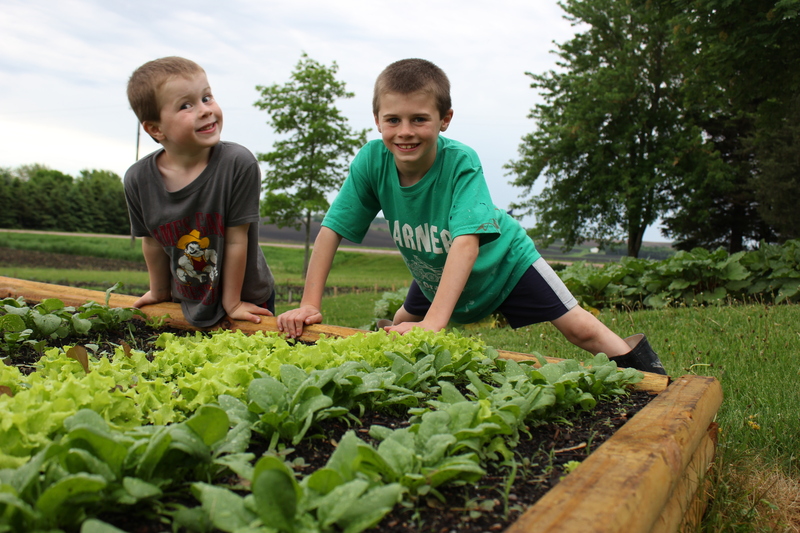 Remember that pick-up and deliveries will be on the schedule you have arranged with Harner Brothers CSA with harvest on Wednesday evenings – please note the exceptions to this which were in the email. The first exception is next week which will be TUESDAY night. It is your responsibility to know that the pick-up or drop-off time will occur at the agreed upon time, and it is your responsibility as a shareholder to know this and be responsible for the produce at that time. If you are unable to utilize your share that week, it is still your responsibility: find someone else to pick it up or donate it to the food shelf. Each box is labeled for each family. The same boxes will be used for your family throughout the season. Boxes and containers should be returned the following week. Bags will only be used once. A lot has been done in the garden this past week including weeding, insect control and planting another crop of snap peas, green beans, beets, lettuces and spinach. Our biggest challenge this week are potato bugs! We have done a lot of research over the last few years and will keep you posted as we work through this. Last year, we planted dill and marigolds with the hope that these plants would draw in beneficial insects to eat the potato bugs and the potato bug larvae. To say we were surprised and disappointed that the potato bugs survived the winter, well that simply is a gross understatement. 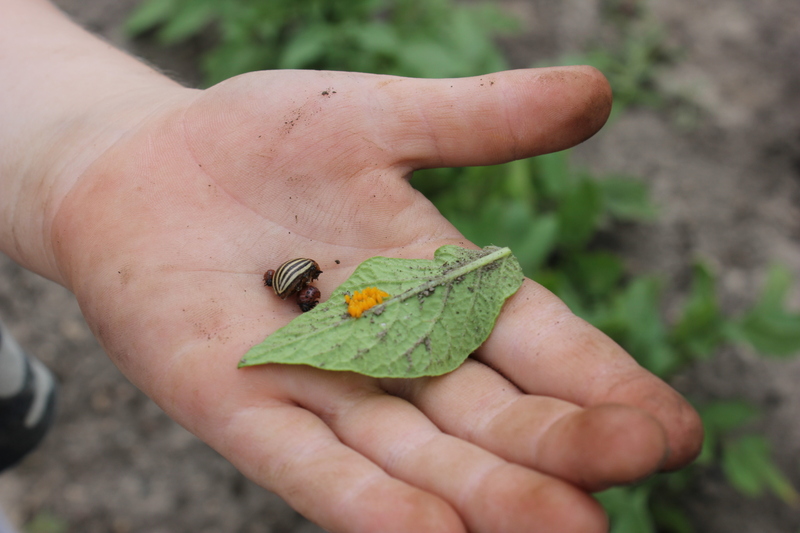 Every night, we are out there picking potato bugs and their eggs off of the potato plants. What is even more frustrating is how they eat the potato plants as they emerge from the ground, and before the potato plants emerged, the potato bugs were eating the tomato plants. Just a few of the potato bugs from one of the nights pickings. The potato bugs must taste so bad that the chickens won’t even eat them. So how much do we dislike them…the boys smashed them with a hammer, if that gives you any indication. Other garden activities included installing a fence for the peas to grow on. Yes, we are upcycling an old child gate for this purpose. Rhubarb – one pound equals about 3 cups. Wash, cut the ends off, cut off any bad parts damaged by wind or hail, chop into 1/4 – 1/2 inch pieces. No need to peel You can freeze it in a Ziploc bag (no blanching) and use for months to come. Our family loves it in muffins, breads, jam, pie, crisp, sauce and torte. Check out earlier posts on rhubarb for recipe ideas. Beet/Beet Leaves – Many times I have seen in high-end restaurants beet leaves in my salads. Well here is your opportunity. These are young plants that we are thinning out of the rows – eat the whole plant. It will add color and nutrition to your salads. Learn more here. Herbs – chives – wash then chop up chives into small pieces. 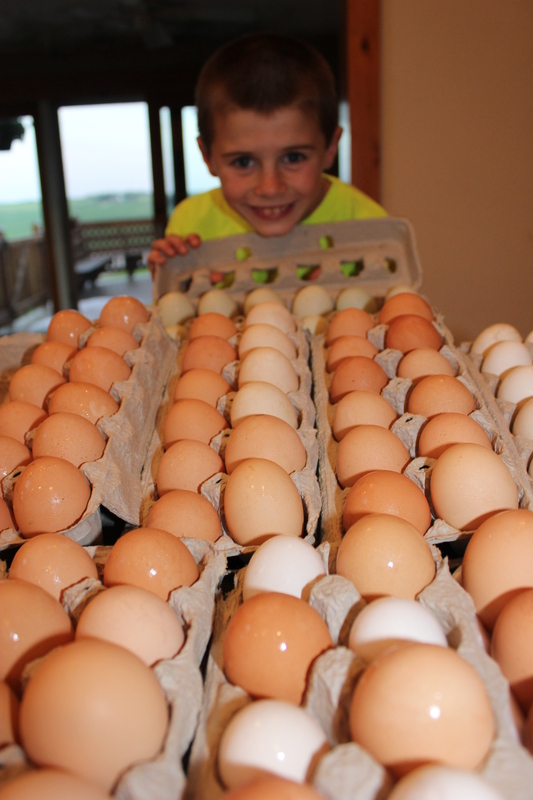 Eggs – from time to time we will provide a few fresh eggs in your box from our chicken flock. We hope you enjoy them! These eggs were all collected this week. Talk about variety from pee wee to extra-large. Fresh cut arrangement – Peonies and Hosta leaves…these last forever in a vase of water. After a week, give them a fresh-cut, and they will last longer. The greenery in the house is a day brightener. One of Sam’s favorites from a dear friend from Wisconsin. We hope your family also enjoys this super easy quick rhubarb dessert. Wash your rhubarb cutting off the end where I pulled it from the ground and give a fresh-cut to the top. No need to peel. Simply cut into small 1/4″ to 1/2″ pieces. Combine 2 c. flour, 2 teaspoons baking powder, 2 tablespoons milk, 2 teaspoons salt and 1/2 cup butter. Cut it together using a pie cutter. 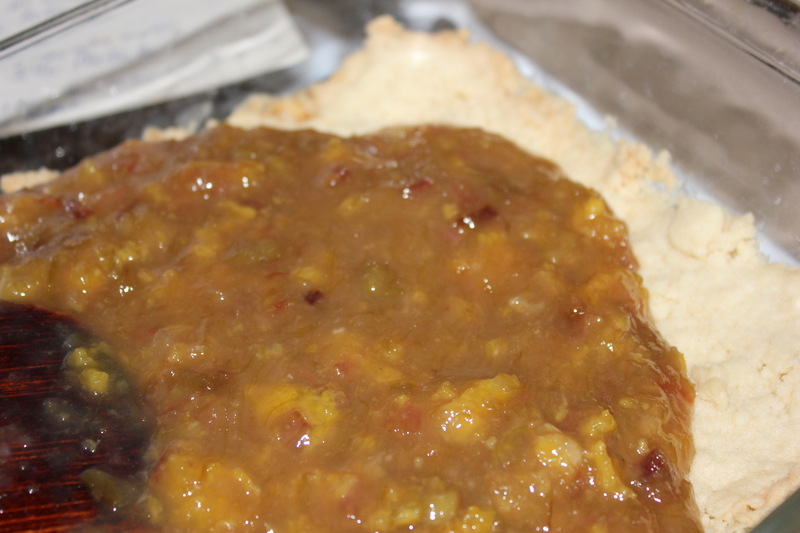 After you have combined the crust ingredients spread it out in the pan and gently pat it. Place 6 cups of cut rhubarb on top of crust. Sprinkle 6 ounce package of strawberry or raspberry Jello over the rhubarb. 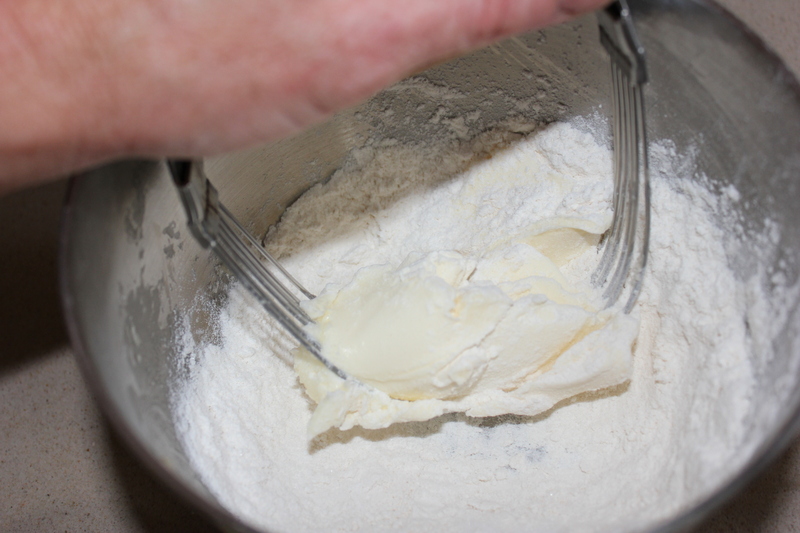 Next in a separate bowl combine 2 cups sugar, 1 cup flour, 1/2 cup butter and cut together using your pie cutter. Gently spread over your rhubarb and Jello. Place in 375 degree oven for 45 minutes. Top with ice cream or Cool Whip. A happy kid is my result. Hope it is yours as well…Enjoy! Mix above ingredients and pat into a 9×13 pan. Place rhubarb over crust then sprinkle Jello over the rhubarb. Mix and put on top of Jello. The spinach, lettuce and radishes are looking great. The rain, heat and humidity have given a needed boost to these plants given our late spring. If I could have only captured the moment on camera on Saturday night as we were attempting the mad dash to finish planting our tomatoes. The scattered thunderstorms had been popping up all afternoon, and it was one of those days where the directions of the storms were a bit unpredictable. Steve and Sam were getting a few more supplies from our garage which left Keith and I in the garden. You also need to know that weather has always fascinated me. If given the opportunity, I would have loved to have been a tornado chaser. So, I looked south across the section and saw heavy rain showers rolling across the field. If you have never seen this, it is a sight to see. It is one thing when it is a light rain (that is a somewhat calm beautiful view). But when the clouds are dark and you can hear the wind blowing and the rain hitting the ground over a mile away, you know it is time to find shelter FAST. Keith had never really experienced this, but thankfully, it was one of those moments when he listened to me – the first time. Perhaps it had something to do with the tone in my voice:) So anyways, I looked south and saw the storm rolling in very quickly. We rapidly picked up our equipment and sprinted into our garage, barely making it before you could hear the thunder of rain hitting the ground. There are many times in my life that I was not so lucky and ended up soaking wet to the bone. This time we were a little wet, and I was laughing so hard after I crossed the threshold of the garage because of the crazy mad dash to the “finish” line. Keith on the other hand was asking me if we were going to have a tornado. I told him no – not to worry and said now you will always understand what it looks like to see a storm rolling in. It appears I will attempt another mad dash to finish the tomato planting this week between storms. Yet, just another example of the crazy life and family experiences from our home. We have had about 1.5 inches of rain since Saturday. This is less than others around us have received. We are thankful for what we have been given. 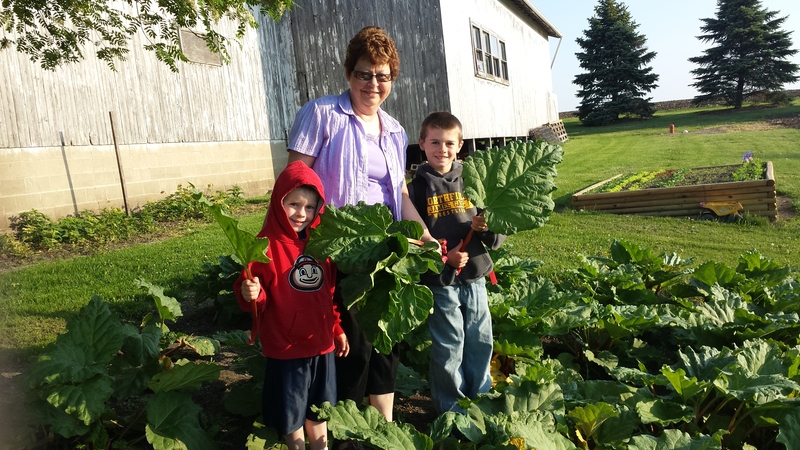 The rhubarb is growing like crazy while the other crops are trying to catch up. The boys were excited to share some with their Grandma. In addition, we do sell rhubarb for $3 per pound. Part of the proceeds go towards disaster relief and Gillette Children’s Hospital. The boys were checking out the cucumbers that have emerged and doing some weeding so the weeds don’t overtake the crops. We finished planting several varieties of tomatoes on Monday night. What a good feeling to have them in the ground! All of you should have received an email with more details of dates and specifics with the CSA. The planting was late this year, but the heat and humidity of the last two weeks have really helped out many of the crops. In addition, we received over an inch of rain since last night. We are excited to see the daily changes and growth in the garden. Look for weekly blog posts for guidance through the season which will provide you with updates, ideas for your box of produce and recipes. Remember that pick-up and deliveries will be on the schedule you have arranged with Harner Brothers CSA with harvest on Wednesday evenings. It is your responsibility to know that the pick-up or drop-off time will occur at the agreed upon time, and it is your responsibility as a shareholder to know this and be responsible for the produce at that time.